Google has recently launched its new Samsung Chromebook in India.The chromebook is priced in India at Rs 26,990/-.Samsung Chromebook is now available for sales in all leading retail stores like Reliance Digital, and also via e-retailer stores. Google has also partnered with Tikona and Airtel to give Chromebook users a range of exclusive cellular and broadband offers.You can get a free Airtel 3G or 4G dongle with new data plans along with Samsung Chromebook. 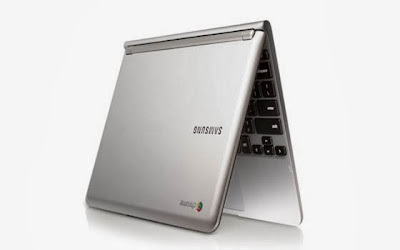 Samsung Chromebook is chipped by a 1.7GHz dual-core Samsung Exynos 5 Dual processor with 2GB of RAM and it runs on Google’s own Chrome OS.Chromebook sports with a 11.6-inch display with a screen resolution of 1366×768 pixels. The storage capacity of Samsung Chromebook is 16GB of SSD (Solid State Drive) and 100GB of Google Drive Cloud storage for 2 years. On the connectivity,Samsung Chromebook supports Bluetooth 3.0,Wi-Fi , 3G Modem, inbuilt VGA webcam, one USB port, one micro-USB port, HDMI port.